Online ordering menu for Lil' Italy Bistro. 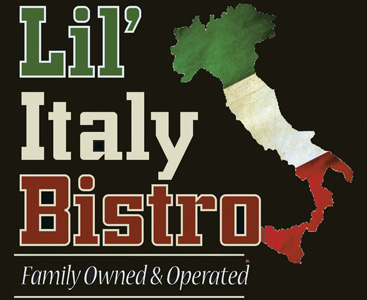 Here at Lil' Italy Bistro, we are a family owned local bistro. Here, you can treat yourself to homemade Italian food while surrounded in a delighting atmosphere. Start off with one of our appetizers such as the Calamari, Chicken Wings, or the Garlic Knots. Our menu features soups, salads, sandwiches, pizza, and more! Don't forget to try one of our entrees such as the Veal Parmigiana, Baked Lasagna, or the Ravioli! We are located on Tamiami Trail across from Audubon Country Club. Bealls Outlet is just a few blocks north of us! Order online for carryout!